Appetizers at a wedding are always a must. With the day starting early and emotions running high, serving a snack before dinner can be a lifesaver. Some fuss-free appetizer options are rolled sandwiches or jumbo shrimp cocktails. If you want to take advantage of the summer season, fresh fruit and vegetable trays are refreshing and perfect for snacking. For appetizers, think of wedding reception food ideas that are small, yet satisfying without filling guests up. 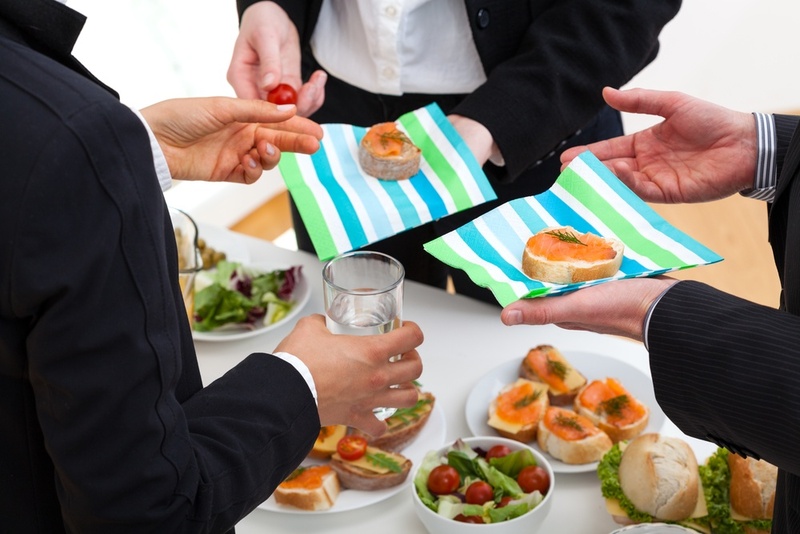 Your caterer can help you plan the best way to serve the appetizer(s) you choose. Who doesn’t like to customize their food? With a build-your-own sandwich bar, guests can do just that! Let’s be honest, not everyone likes to eat the same thing. With the various diets, eating plans, and food restrictions we see today, having the ability to choose your ingredients can be a big crowd pleaser! This option makes it easy for guests to create a meal that works for them, and they'll be much happier as a result. Pasta bars are also a wedding favorite. 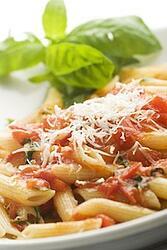 Most people enjoy pasta, especially when it's filled with the ingredients they've chosen. Don't count the pasta bar out during times of warmer weather, the various pasta salads you can create for your outdoor wedding reception are endless. 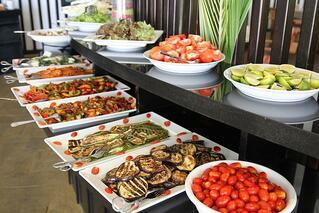 You can never go wrong with a buffet at your wedding. As far as wedding reception food ideas, a buffet is typically cheaper than paying for each plate, and with a buffet, people can pick and choose what they would like to eat. Some great buffet entrée options for your wedding include stuffed chicken breasts, carved roasted turkey, prime rib, or beef tenderloin. If your wedding reception is more casual, you might opt for a picnic style buffet to match your wedding feel. This buffet includes entrée items like pulled pork or chicken sandwiches, burgers and brats, or grilled chicken sandwiches. Planning a wedding is a lot of work, but having an idea of what wedding reception food ideas to choose from can be a major stress reliever. We hope these outdoor wedding reception food ideas will help you in planning your big day. To make planning your wedding reception menu a little easier, discuss whatever needs or concerns you may have openly and honestly with your caterer. Their goal is to alleviate any food-related stressors for your big day.